Jaguar Wild Cat – June 2009: As you might have guessed this article is called, “Jaguar wild cat”, because about 99% of people searching for information about the jaguar, are searching for information about the car. Yes, it’s as high as that (measured through keywords). It is very telling and says a lot about why the survival in the wild of many wildcats is in a perilous situation. Many products and teams are named after the jaguar because we admire the animal. Unfortunately, admiration does not always translate to respect as its population is in decline due to human activity. This page contains a customised Google map of the Jaguar range that is based as accurately as possible on the IUCN Red List of Threatened Species™ map. It is designed to be refined by anyone with the will and the ability to do so! If you’d like to try please go to the original, which opens in a new window: Jaguar Range 2009. The range on this map is complicated and broken down into a series of ranges that knit together. The reason for this is to make it possible to build it and for ease of reference. The dark green areas surrounded by a blue line are where the range is fragmented. There is also another map further down the page, which is slightly different. This is not unusual as it changes and our knowledge of the range is not complete. The green area in the map below represents a fragmented jaguar population – red=distribution. Green=fragmented. The scientific name is Panthera onca (Linnaeus 1758 – Linnaeus was a well known Swedish zoologist who saw no..”difference between man and simian that [follows] from the principles of Natural History” – I agree). This is the largest felid (the carnivorous mammals of the family Felidae, which includes domestic cats and wildcats) in the Americas (the continents of North America and South America with their associated islands and regions). Morphologically (the form and structure of an organism) the jaguar is similar to the leopard, which can confuse. Indeed the two are closely related members of the genus Panthera. The difference is that the jaguar is heavier and more powerful than the leopard. While the leopard is lithe and graceful, the jaguar is stocky and muscular with shorter legs. There is also a difference in the coat pattern. The spots of a jaguar are generally larger (and, therefore, there are less of them) than for the leopard. The jaguar’s head is large and it has a more powerful bite than the other big cats. Jaguars vary widely in size depending on the region where they are found. This is believed to be due to the availability of prey. The jaguar can be quite small (for a “big cat”). For example, 56 kg (see below) is 123 lbs or about 8.8 stones, the weight of a light women. To compare the jaguar with other wildcats please click on this link. There is an, almost, 100% weight difference from one region to another. Average jaguar weights are therefore unworkable. Perhaps, in part, because of the wide range in size, eight subspecies have been recognized but genetically and morphologically, subspecies are not supported (although Pocock’s subspecies divisions are still regularly listed in general descriptions of the cat – www.jaguarssp.org). The biggest differences between the appearance of jaguars is found when they inhabit areas that are the furthest apart in terms of latitude (src: IUCN Red List of Threatened Species™ – “Red List”). The jaguar is the third largest wildcat after the tiger and lion. The coat is magnificent as is usual for the wildcats, particularly the big cats. The body is covered in rosettes (a term used in the cat fancy too), which are irregularly shaped hollow centred spots or blotches with, usually, a black dot in the centre. They are set against a ground colour that is between pale yellow and tawny. The underbelly, throat and inside the legs are white and are also covered with rosettes. The tail is banded over the half towards its tip and there are spots at the body end. The ears are small and rounded with a faint spot on the ear flap (this spot is common to many wildcats). Melanistic jaguars (black – see photo) still have markings but they are faint. Black jaguars are not a separate species although this was thought to be the case at one time. The jaguar’s coat varies widely in pattern and ground colour. In addition to the name jaguar, it is known as “el tigre” (the tiger) in much of South America. The name “jaguar” was originally, “yaguará” (meaning wild beast that overcomes its prey in a bound – src: Wildcats of the World). Paul Smith Ph.D, writing in the FCF magzine of March/April 2010, says that there are four existing (at 2010) subspecies of jaguar wild cat: West Mexico (P.o.hernandesii), Southern Arizona to Sonora, Mexico (P.o.arizonesis), Texas to south east Mexico (P.o.veracrusis) and Yucatan, Belize and Guatemela (P.o.goldmani). Although my research using the best sources indicates that there are no jaguars left in the USA (Arizona and Texas as referred to by Paul Smith). Update: there may be some vagrant jaguars in southern Arizona and possibly New Mexico (2012) where it is proposed that there could be a series of reserves covering over 800,000 acres. The jaguar wild cat has played an important role in the culture of the peoples in the countries that they share. There are examples of ancient art depicting the jaguar. For example, the Olmec people of Southern Mexico some 2000 years ago built pavement mosaics of a jaguar god and carved large jaguar heads. In South America the jaguar is associated with thunder, lightening and rain and was thought by the Aztecs to control these elements (src: www1.american.edu). This may originate from the yellow colour of the jaguar, representing the sun and the voice representing thunder. Thunder is considered to be the voice of the sun in the Tukano Indian myth. As the jaguar wild cat is also considered to be the master of animals (this translates, it seems to being the top predator), there is a tendency to worship it, revere it and to try and be it as it is associated with power, strength and success. Olmec and Chavin art shows part jaguar part human figures. Jaguars are incorporated into pottery by the Mochina people of Peru. Ancient Peruvians sacrificed jaguar cubs. The symbolic art was made to indicates social status and to improve the chances of successful hunting. There is the usual and strange dichotomy between worshipping the jaguar and killing it. It probably originates in an attempt to possess the jaguar’s powers and killing the jaguar and wearing body parts etc. is thought to achieve this. The shaman would take on the jaguar’s powers and behave like a cat eating raw meat etc. In Brazil it was, apparently, believed that the fat of the jaguar would give them courage and if rubbed on themselves it would provide protection (src: Wikipedia). However, if you would like to stay on this page I discuss these matters here in overview. The range of the jaguar wild cat is indicated on the map below, which was made before the Google map above and it is apparent that the exact range is either shrinking or is not known with great accuracy, which is what I would expect as reasonable. The Google map has the potential for being the most accurate anywhere because of the detail that can be obtained. Based on Red List information, I have added to this map (blue areas and notes) , which is by Denniss and Rosarinagazo and published under Wikimedia® creative commons license = Attribution-ShareAlike License. The most important information in this section is that the jaguar wild cat has been eliminated from large parts of its previous very wide range. The red section above tells this story and the blue section loss refers to more recent history. The jaguar is native to these countries: Argentina; Belize; Bolivia; Brazil; Colombia; Costa Rica; Ecuador; French Guiana; Guatemala; Guyana; Honduras; Mexico; Nicaragua; Panama; Paraguay; Peru; Suriname; United States; Venezuela and extinct in these regions: El Salvador; Uruguay. It no longer occurs in much of Argentina and is almost extinct in Paraguay. Until 20th century Jaguars occupied Arizona, Texas, New Mexico. 1920 Jaguar wild cat seen northwest of Tucson, Arizona. 1996 Male jaguar sighted in south eastern Arizona. 2005, Feb 25th A 118 lb (53 kg) well known, Jaguar (named “Macho B”) was caught, radio-collared & released southwest of Tucson, Arizona. 2009, March 2nd Macho B euthanized suffering from kidney failure in Arizona. The jaguar wild cat is a very able swimmer and spends time in the water to remain cool. Their preference for water courses probably leads them to follow rivers when travelling large distances. This wild cat moves and hunts on the ground and is a capable climber. Cats are often crepuscular. The jaguar, however, seems to vary its activity to suit the availability of prey, which covers a wide variety and to avoid human activity (nocturnal). White tailed deer – see picture below (54% of prey) Chamela-Cuixmala Biosphere Reserve, Jalisco, Mexico. a bite through the prey’s skull between the ears and horns (evidence of its very powerful bite) or to the back of the head, or through each ear (capybaras). Jaguars are able to bite into the carapace of a large turtle. This way of killing prey can lead to worn and chipped canine teeth, unsurprisingly. a female jaguar weighing 41 kg dragged prey weighing 180 kg over 200 metres of steep and rocky terrain. a jaguar dragging a dead cow into the Apure River and swam 800 metres across the river with the cow in tow. the degree of prey predation by people forcing the jaguar to look for alternatives. See also jaguar food chain. by roaring (remember the thunder myth above). See Tiger Roar for information on this sound. Southern Pantanal, Brazil. Severe flooding causing predators being concentrated on high ground 4 female jaguar wild cats had varying home ranges between 97 and 168 km². The ranges overlapped a lot. The ranges varied with the seasons; 4-5 times smaller in wet season for both sexes than in the dry season. Acurizal Ranch, western Pantanal. Less flooding than above Female ranges relatively small. Mother and daughter had same range size at 38 km² overlapping with another female with a range of 25 km². Adult male range covered 90 km² & overlapped both female ranges. Venezuelan Ilanos Adult male jaguar wild cat overlapped the ranges of 2 adult females (at least). In the dry season one female had a range of 80 kgÂ² decreasing to 51 km² in the wet season, while the other had a range of 53 km² in the wet season. Subtropical forest habitat Average home range of males was 110 km², while an adult female range was 70 km². Cockscomb Basin, Belize (a reserve) Male ranges were between 28 to 40 km² with substantial overlap. 2 female ranges were estimated at 10 km² and both female ranges were overlapped by the male ranges. 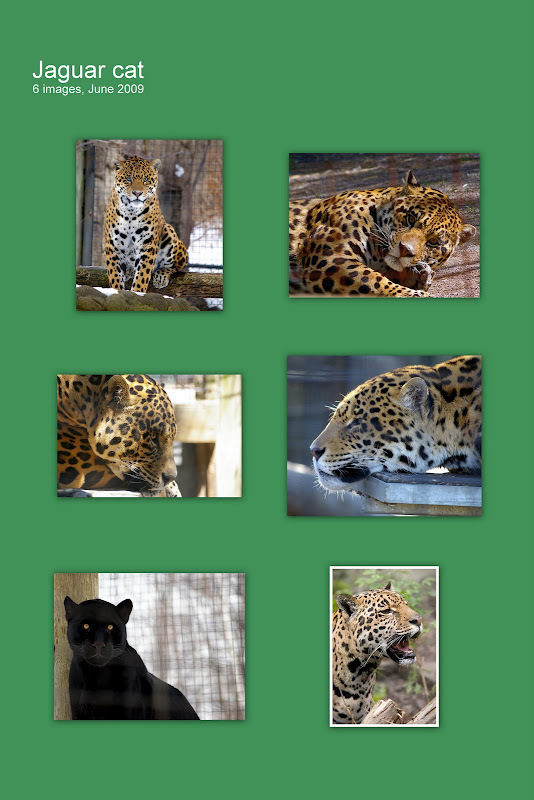 Here is a little page on jaguar reproductive behavior taken from a news item. Update: a page on jaguar sounds. There are some audio files to listen to. As to longevity, in the the wild, the jaguar wild cat lives to a maximum of about 11 years (Belize). In captivity the story is very different being 20 years – a known maximum is 32 years. See also jaguar cubs. treated as pests by ranchers and shot despite poor and laissez faire management of livestock. This is compounded by ranchers injuring jaguars who are then obliged to prey on cattle (easy source of food) as they are unable to do otherwise. despite being listed in CITES Appendix I, which means: “….species that are the most endangered among CITES-listed animals and plants. They are threatened with extinction and CITES prohibits international trade in specimens of these species except when the purpose of the import is not commercial..” – (src: CITES), the jaguar wild cat is still poached for body parts as there is still a demand for paws, teeth and other body parts. This wild cat is protected by prohibitions on hunting (but see above – lack of enforcement) in: Argentina, Brazil, Colombia, French Guiana, Honduras, Nicaragua, Panama, Paraguay, Suriname, United States, and Venezuela. There are restrictions on hunting in these countries: Brazil, Costa Rica, Guatemala, Mexico and Per. Better livestock management is being addressed apparently. There is an ambitious plan to preserve a north to south habitat corridor throughout the entire range. There are national parks and reserves such as the ManÃº National Park in Peru and the Sian Ka’an Biosphere Reserve in Mexico. One of the great problems is a lack of commitment to enforce legislation protecting the jaguar and coherent management and planning. All the jaguar wild cat problems are human generated. Although I don’t wish to criticise the person in this video, it tells us something about our relationship with the wildcats. We don’t seem to be able to live in harmony with them in the wild. Jaguar wild cat – all photos – these are published under a Attribution-NonCommercial-NoDerivs creative commons License — this site is for charitable purposes in funding cat rescue. The picture of the jaguar logo at the top of the page is by blueraine_tigerseye – photo of jaguar portrait towards bottom of page: by Thorsten Becker . Jaguar wild cat – Sources: I am greatly indebted to the fine book, Wild Cats of the World by Mel Sunquist and Fiona Sunquist. Other sources: IUCN Red List of Threatened Species™, WikipediaÂ®, the sources as embedded in the text, my website PoC, various other websites for minor details and verification. This entry was posted in Jaguar, Wild Cat Species and tagged big cats, jaguar, jaguar distribution, jaguar pictures, jaguar range, jaguar wild cat by Michael Broad. Bookmark the permalink.